Often it is not the big, radical changes that cause improvement but basic, unremarkable details that ultimately make a difference. First, some thoughts about positioning of the fingers that makes sense physiologically. 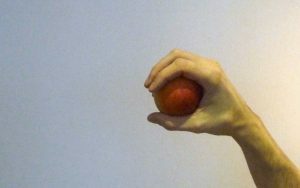 It is often best to think in terms of everyday, “natural” movements, like grasping an apple, for example. 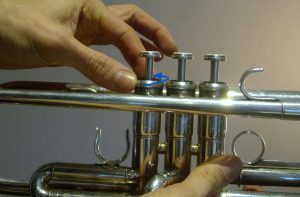 By doing so, it becomes impossible to press the valves with a less convenient hand position. 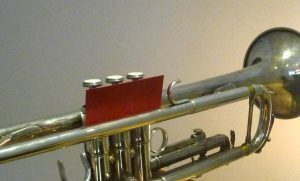 Simply leave the cardboard at the trumpet for several weeks so that this new way of pressing the valves becomes a habit. 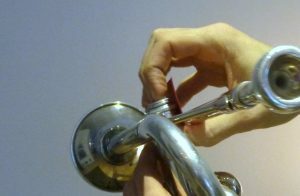 Also note that you are holding the trumpet with the left hand, so that the right hand, with which you are also pressing the valves, is relaxed and does not have to do double duty, namely hold the trumpet AND press the valves. 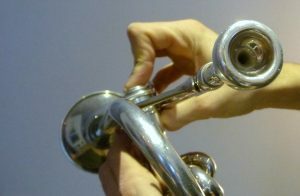 How you can get your fingers to move faster. 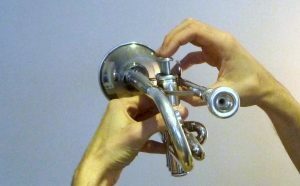 A useful trick is to unscrew the valve a little (only far enough that you hear a sound when you press down). 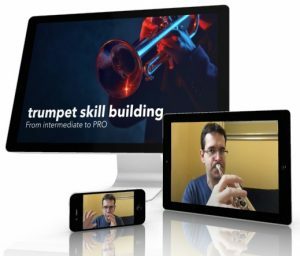 By doing that, you now have a kind of “drumset” and the immediate feedback it provides. For if you now press fast enough, you will hear a click and if, instead, you press only half-heartedly, there is no sound. 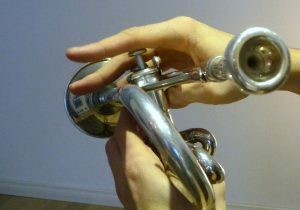 An important aspect of playing the trumpet that you should pay attention to is the independence of pressing valves from air flow. 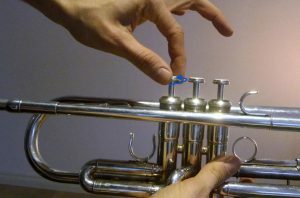 It often happens that with every quick press of the fingers, you also blow harder. As a result, every note is accentuated. 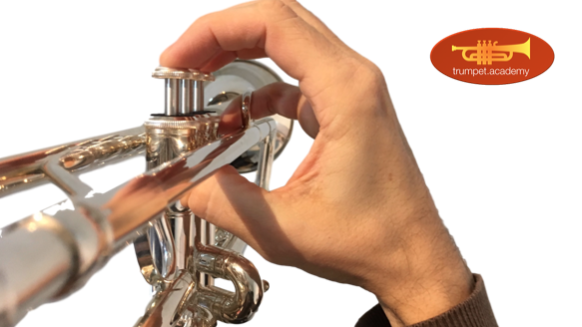 However, the idea really is that you let the air flow uniformly while the fingers continue to make their “jerky“ movements independently. Let me know if these tips are helpful as you put them into practice.